A US air strike killed a senior leader of the Islamic State (IS) group in Libya, the Pentagon has confirmed. Pentagon spokesman Navy Capt Jeff Davis said Abu Nabil died after an F-15 jet targeted a compound in the eastern city of Derna on 13 November. Iraqi national Nabil was also known as Wissam Najm Abd Zayd al-Zubaydi. The Pentagon also said an air strike in Somalia on 2 December had killed a senior al-Shabab leader, Abdirahman Sandhere - also known as Ukash. US officials said the 13 November strike against Nabil had been authorised before terrorist attacks in Paris that evening that IS claimed responsibility for. "Nabil's death will degrade Isil's (IS) ability to meet the group's objectives in Libya, including recruiting new Isil members, establishing bases in Libya, and planning external attacks on the United States," the Pentagon said at the time. 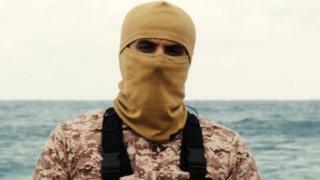 US officials said that Nabil may have been the IS spokesman pictured in a February 2015 video showing the apparent murder of Coptic Christians in Libya. Libya remains in chaos four years after the overthrow of Muammar Gaddafi, and is being fought over by a number of groups, including IS. It has launched high-profile attacks in the mostly lawless North African country, and gained a foothold in key towns and cities, including Sirte. The strike on Nabil was the first against an IS leader in Libya, the Pentagon said.